Attach Plus | First Direct Corp.
Is Attach Plus right for you? Does generating and attaching a PDF or ZIP file take longer than it really should? How are you currently ensuring confidential e-mail attachments you send to customers are password protected? Have you ever sent a sensitive attachment to the wrong recipient by mistake? Document Management: Attach Plus works with most major document management systems by right clicking, “E-mail” or the Print command. Attach Plus was designed to answer these questions by exceeding the security requirements of financial advisors who regularly send sensitive personal and financial information as e-mail attachments to their clients. Now, Attach Plus can be used by anyone wanting the same level of security, speed and ease-of-use to attach encrypted PDF or ZIP files to e-mail. Attach Plus adds a button to your e-mail application’s “Select Files” dialog window. From the “Select Files” window you can attach the file “as-is”, convert it to an Adobe Acrobat PDF or compress it into a ZIP file. On the same screen you can secure the file by selecting a password and choosing only the pages you want and attach. It’s that easy, efficient and secure! You can even use the Attach Plus print driver to e-mail PDF snapshots from any application that has print capability. Merge PDF – Combine documents to one PDF with customized Bookmarks! Print to PDF and Attach – Automatically converts the document to an encrypted PDF then attaches to a new or existing e-mail. The PDF is saved in the Sent Mail folder of your e-mail program. Print to PDF, Save and Attach – Automatically converts the document to an encrypted PDF, saves PDF to your system, then opens a new or existing e-mail. The PDF is saved in a folder and in the Sent Mail folder of your e-mail program. Merge PDF – Combine documents from multiple applications with the ‘Merge’ feature to create one PDF attachment. 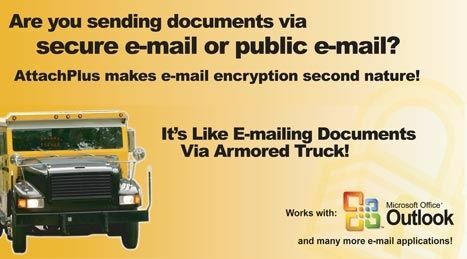 Have you ever wanted to send more than one attachment in an e-mail, but from different software applications? Attach Plus integrates into any MAPI compliant application (such as Microsoft Office, Word Perfect, or most Windows applications) that provide the option to select “File->Send To-> Mail Recipient” from the main menu. * Paperclip button integration not available. **Requires additional software (with modest fee) from Affixa. Attach Plus is sold as an annual software subscription. You will be contacted about your annual software renewal as your purchase anniversary date nears. Workstations: You must purchase an Attach Plus license for each workstation to which Attach Plus will be installed. Terminal Servers: Each concurrent terminal server user session requires an additional Attach Plus workstation license. For example, a firm with 25 regular workstations plus a terminal server with 15 CALs (Concurrent Access Licenses) would need a 40 workstation Attach Plus license. Please enter your information to download a free trial of Attach Plus.